The Toshiba laptop has had the same video problem again. See 2005 #02 for details. There are some lingering doubts about the Toshiba Product Line A75. Two hardware failures in four months and no 12v power supply is not what you would expect in a laptop. Maybe not quite “World Class”. In the last two weeks, we have again seen “World Class” in action. Toshiba, Ideal Electronics of Athens and ACS(Greek Courier Service) performed well above reasonable expectations. On a different front, Whitlock Steering and their parent company Lewmar, both British, have demonstrated the dismal side of the yachting industry. 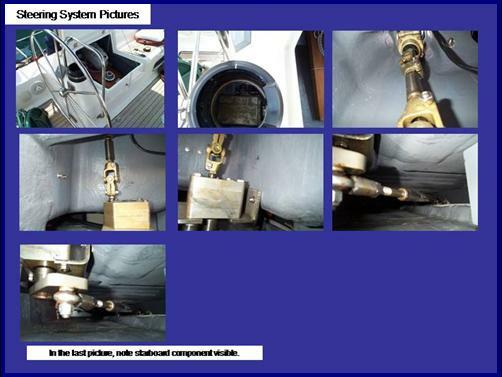 In early May we discovered some oil under one of the steering columns. Like oil on the garage floor, it had to come from somewhere. The local technician said he had never seen anything like it and agreed that asking Whitlock was appropriate. We emailed Nautilus, the Lewmar Distributor for Greece and Elan, the boat builder, in the hopes that we could get an explanation. The man at Nautilus was quick to reply. He asked first off what model and part was leaking. The components are devoid of model or part number. The only identifying mark is the Whitlock logo on the wheel hub. The model and part was identified by reading and looking at pictures in a German language catalog. What’s a language impaired boy from Texas doing reading a German catalog in a Greek chandlery to spec out a British product bought from a Slovenian boatbuilder? The bevelboxes are filled with grease. It is possible that on some occasions the 'liquid part' of the grease sweats through the bevelbox covers. This is nothing to worry about as there will remain enough grease in the bevelbox and it is only the 'liquid part' of the grease that sweats trough. Normally spoken this sweating stops after a while, if not than tension the scews a bit tighter to get more pressure on the cover. In case this does not help please let us know. Thank you for this reply. In the last two weeks, the reduction gear box was sent to the Lewmar Distributor, Nautilus, in Athens. There, they replaced three of the bearings and two of the seals. They did not replace the lower bearing and seal because it is welded into the assembly. The box came back from Athens last Friday. When installed, it does not turn at all. It is now on its way back to Athens where hopefully they can make it right. The absence of any documentation with this product is disappointing. None came with it. None is on the Internet. We are watching a lot of boats sail in and out of this marina while we wait for a Whitlock Steering System that works. 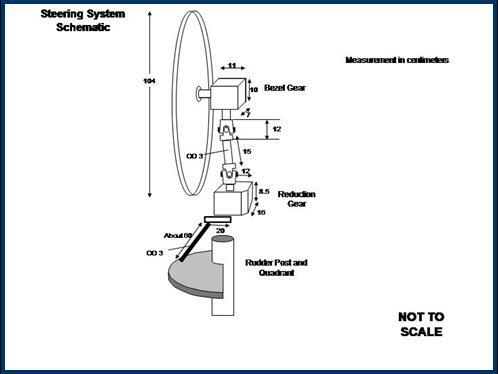 The fact that the main bearing, gear and shaft that deals directly with the rudder quadrant, IE most of the force in the system, is welded in appears to be a design fault. Fred must have been a bit too terse. There has been no information from the Netherlands nor Slovenia since. He did not mention that grease is mulsified oil. Nautilus in Athens sent the reduction gear to England. At Lewmar Steering Division in Luton, they sat on it, hoping it would hatch. They are still sitting on it. We are moving the factory to new premises at this time so I have not been able to locate the WRG10 as it is probably packed and on it's way to the new site. We will re-open the factory on the 8th August and I have asked Chris Marks to locate this when we are back. Little wonder the Chinese are buying up the last British car maker. PS: The good news is, Perception has four steering systems: 1)port and 2)starboard wheels, 3)Autohelm and the 4)emergency tiller. They are independent to the quadrant on the rudder stock. Three out of four still work. We are still cruising.